A committee of terns on a dock, Indian River Lagoon, Hutchinson Island side. That’s the bridge between Hutchinson Island and Sewall’s Point in the distance. The Royal Terns look a lot bigger than the Sandwich Terns, when they are right next to each other. It was around 8:30 a.m. I wonder if they spent the night “roosting” on this tern-popular dock. One or two would fly off south now and then. I think that’s a juvenile Laughing Gull. The Royal Tern looks pretty big next to a gull too. Gulls and terns (and skimmers) are in the same family, Laridae. Laridae is a family of seabirds in the order Charadriiformes that includes the gulls, terns and skimmers. It includes around 100 species arranged into 22 genera. They are an adaptable group of mostly aerial birds found worldwide. The big Royal Terns are Thalasseus maximus and the smaller Sandwich Terns are Thalasseus sandvicensis. Thalasseus terns feed by plunge-diving for fish, almost invariably from the sea. They usually dive directly, and not from the “stepped-hover” favoured by, for example, the Arctic tern. The offering of fish by the male to the female is part of the courtship display. These species have long thin sharp bills, usually a shade of yellow or orange except in the Sandwich tern and Cabot’s tern where the bills are black with yellow tips in most subspecies. All species have a shaggy crest. In winter, the Thalasseus terns’ foreheads become white. “Sandwich” refers to Sandwich, Kent, England where they were first described and classified by ornithologist John Latham in 1787. Collective nouns for our fine feathered Thalasseus friends? thespruce.com: A cotillion of terns. nzbirds.com: A highness of Royal Terns and a hogey of Sandwich Terns! Country Life: a committee of terns. As author Chloe Rhodes explains in An Unkindness of Ravens: A Book of Collective Nouns, unlike proverbs, rhymes or homilies, many of these words endure because they were recorded and published in Books of Courtesy handbooks designed to educate the nobility. ‘They were created and perpetuated as a means of marking out the aristocracy from the less well-bred masses,’ she writes. This entry was posted in Uncategorized and tagged Laughing Gull, Royal Tern, Sandwich Tern on September 22, 2018 by Amy. This was the scene at Bob Graham Beach, Hutchinson Island last Tuesday: a thick black line of bait fish in the blue-green ocean. A fisherman told me the bait fish running at this time of year are called “anchovies.” The big and famous mullet run comes a few weeks later. I love when the wind and surf are calm enough to see into the water like this. It’s like the Caribbean then, instead of the often-windy Shipwreck, I mean Treasure Coast. Tarpon were cruising along right offshore beyond the bait line, occasionally swirling on the surface as they fed on little fish. I didn’t get any good tarpon shots but trust me it was an impressive show and everyone on the beach was enjoying it. Here’s a drone video of tarpon during the mullet run at a beach further south on the Florida coast: Florida Mullet Run & Tarpon. But let’s get to the birds! Ruddy Turnstones still in breeding plumage. Must be migrating down from their northern nesting areas. It may be 90 degrees but “bird fall” (and fish fall) has begun. A little further down the beach, lots of terns including this Royal. 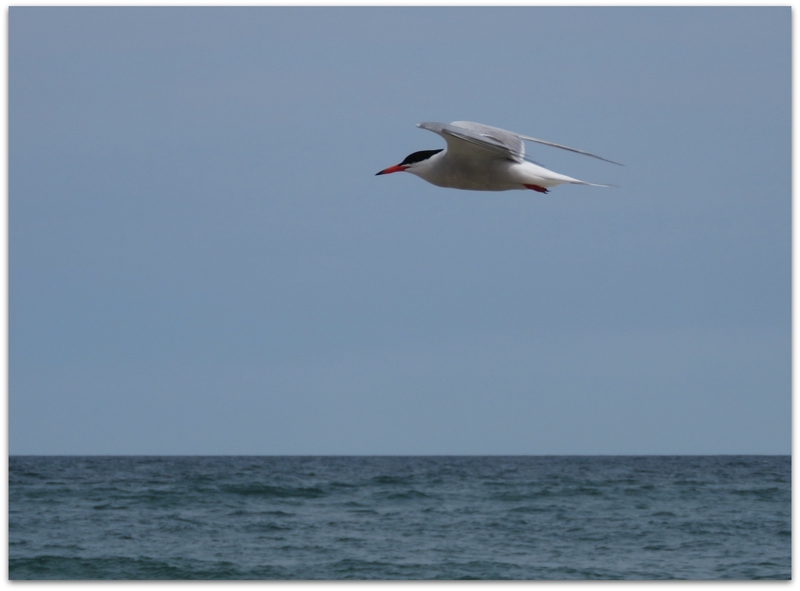 I’ve been trying to learn our local terns! This one is a Sandwich Tern. A bird of marine coasts of the southeastern United States and the Caribbean, the Sandwich Tern is readily identified by its shaggy crest and yellow-tipped black bill. The tern with the large orange bill is a Royal Tern. Sandwich Tern above and non-breeding Laughing Gull on the right. Step aside for the lone White Ibis, little Laughing Gull! A beach full of fat and happy birds, having recently fed on the abundant bait fish. The terns do the work and the gulls steal their fish, often. Though I have seen the gulls skim a fish right off the surface of the water too. I think the one smaller tern with the orange bill is a Common Tern. But they look like Forster’s Terns too. 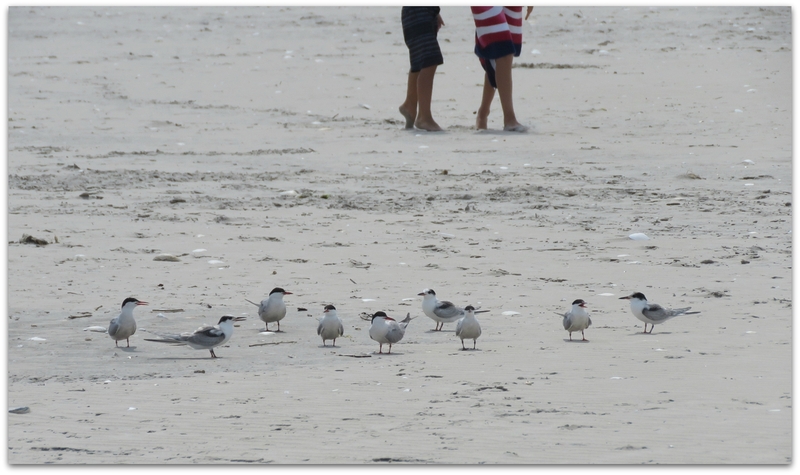 Sandwich Tern and some Laughing Gulls. Very distinctive bill, in color and length – I think I’ve learned this tern. Family dynamics of Sandwich Terns? These women stopped and turned around when they got to the birds. Very polite of them not to make them fly. Gull practicing its thievery skills. Two adult non-breeding and one immature Royal Tern in this pic. Sandwich Terns with the Laughing Gulls here. So many fish to choose from. Royal Terns and Sandwich Terns. Don’t you want to be the researchers?… hey, we found the Piping Plovers… in the Bahamas! This entry was posted in Uncategorized and tagged Laughing Gull, Piping Plover, Royal Tern, Ruddy Turnstone, Sandwich Tern, White Ibis on August 18, 2018 by Amy. I saw this juvenile Black-crowned Night Heron on the mud flats by the Snook Nook bait and tackle shop in Jensen Beach the other morning. I like the pattern of little triangles on the feathers. The pier behind the bait and tackle shop is a popular resting spot for a variety of Indian River Lagoon birds. Great Blue Heron wades below. These Laughing Gulls seem to be just waking up. Tern hanging with the gulls. I think it’s a Sandwich Tern because the bill is dark and maybe tipped with yellow. The light isn’t great for getting the colors, but Royal Terns have orange bills that are pretty bright. One of my summer bird goals is to learn more terns. Bird holding still. Always good for my level of photography skill! Yo! Does this night heron need a cup of coffee or what? This entry was posted in Uncategorized and tagged Black-crowned Night Heron, Great Blue Heron, Laughing Gull, Sandwich Tern, White Ibis on July 6, 2018 by Amy. Gulls eating Doritos, South Beach Park in Fort Pierce on Hutchinson Island yesterday. Sitting in a beach chair on a perfect sunny warm day is a nice way to watch birds. Our New Hampshire snowbird friends were with us. These two gulls were together for a while. This is a Laughing Gull. They have solid black heads in breeding season so maybe this one is transitioning. Swirling over beaches with strident calls and a distinctive, crisp black head, Laughing Gulls provide sights and sounds evocative of summer on the East Coast. You’ll run across this handsome gull in large numbers at beaches, docks, and parking lots, where they wait for handouts or fill the air with their raucous calls. Laughing Gulls are summer visitors to the Northeast and year-round sights on the coasts of the Southeast and the Gulf of Mexico. This one is a Ring-billed Gull. I would see them a lot in New Hampshire. This one looks like a “second winter” gull with tan streaking. Familiar acrobats of the air, Ring-billed Gulls nimbly pluck tossed tidbits from on high. Comfortable around humans, they frequent parking lots, garbage dumps, beaches, and fields, sometimes by the hundreds. These are the gulls you’re most likely to see far away from coastal areas—in fact, most Ring-billed Gulls nest in the interior of the continent, near freshwater. A black band encircling the yellow bill helps distinguish adults from other gulls—but look closely, as some other species have black or red spots on the bill. Laughing Gulls and their distinctive calls remind me of summers at the Jersey Shore when I was growing up. This is a very vocal species whose common call is a loud, descending series of laughing notes lasting 3 seconds or more. 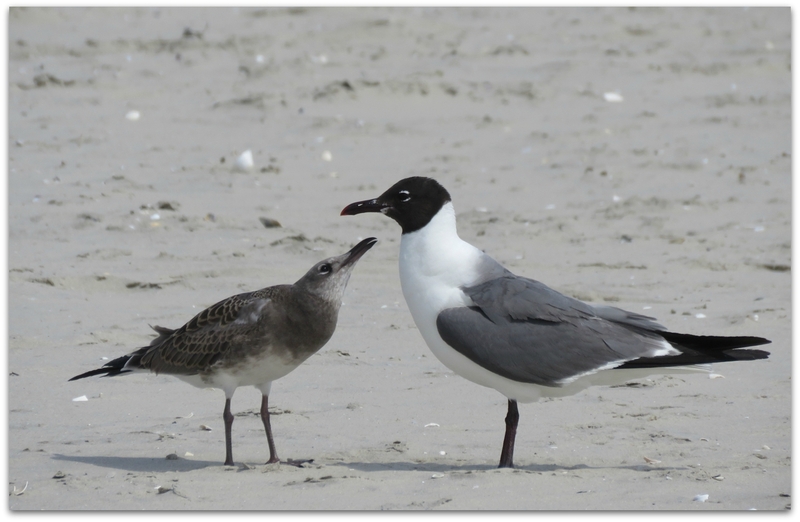 Ring-billed Gulls are here only in winter/ non-breeding season, whereas Laughing Gulls are year-round residents. As with humans, it’s a busy season when residents and snowbirds are in Florida at the same time. This entry was posted in Uncategorized and tagged Laughing Gull, Ring-billed Gull on March 19, 2018 by Amy. 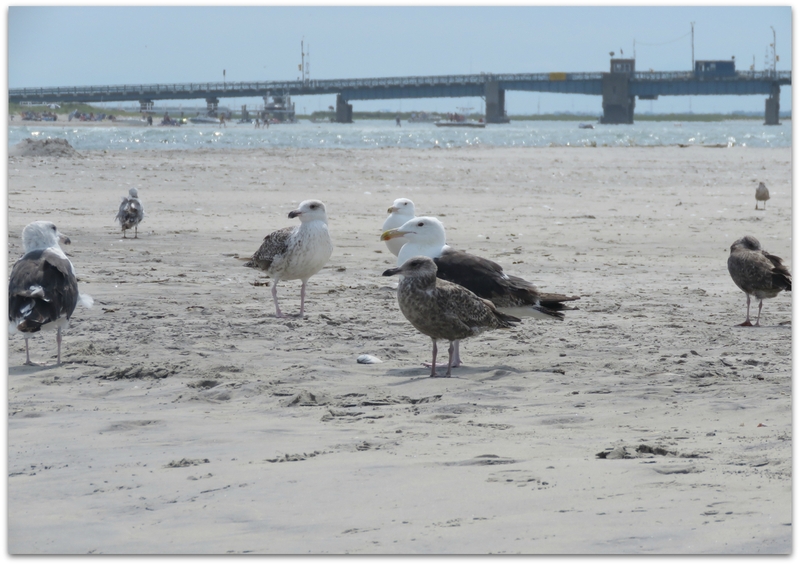 Gulls at Corsons Inlet, Ocean City, August 7. Common terns? and a couple of kids. Corson’s Inlet State Park is located at the southern end of the island and city of Ocean City. More photos on Flickr: Birds at Corsons Inlet. A graceful, black-and-white waterbird, the Common Tern is the most widespread tern in North America. It can be seen plunging from the air into water to catch small fish along rivers, lakes, and oceans. Swirling over beaches with strident calls and a distinctive, crisp black head, Laughing Gulls provide sights and sounds evocative of summer on the East Coast. This entry was posted in Uncategorized and tagged birds, Common Tern, Corsons Inlet, Flickr, gull, Laughing Gull on August 11, 2015 by Amy.